Your balloon base is taking shape nicely. We've filled the balloon with sand and dressed it up with tulle and cellophane. Now it's time to add the finishing touches. Take two 600mm lengths of the color matched curling ribbon and pass them through the ring (fig. 1). Tie them in the middle with two securing knots (fig. 2). Taking each ribbon in turn between your thumb and index finger, curl the ribbons with your scissors. You'll find this process easier if you hold on to the ring (fig. 3). 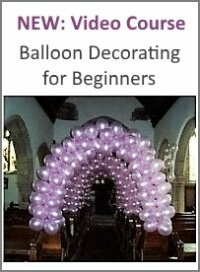 When you've completed this, take a 600mm length of white curling ribbon and tie it around the neck of your base, again using two securing knots. Then curl the white ribbons with your scissors (fig. 4). Your base is practically finished. 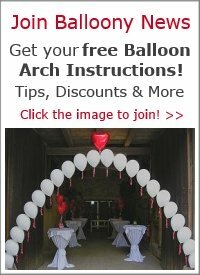 The ends of the ribbons which attach your balloon bouquet will also be curled and give the crown of your base a much fuller effect. One optional decorative touch that you may add is to place your base on a tulle or paper doylie and for a final flourish, sprinkle on some nice metallic confetti. 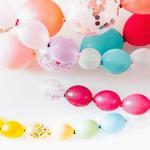 In our example we used a paper doylie and multi-colored, metallic balloon shaped confetti. Your balloon base is completed. 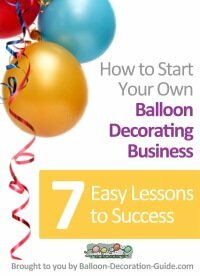 Now, are you ready to start creating your Balloon Bouquet "Simple & Elegant"?